For the love of life: JustRite Papercraft's May Release Day 3! JustRite Papercraft's May Release Day 3! Good Friday Morning to you all!!! We are on day 3 of our JustRite Papercrafts May Release, and if you are just tuning in, make sure you check out the previous days! You won't be sorry. Today's post brings me to a very feminine project, that I so love! It all started out with my favorite tea can from Coffee Bean and Tea. Have you tried their Swedish Berries iced tea????? OMG, I am so in love with it, that I had to buy the tea, so I could have it every day. Who wants to spend almost $3 on tea? Not I, so I thought this would be a much better deal and I just finished my first can...LOL. Yummmmm...you better try it as soon as you can. Ok, so back to JustRite Papercrafts and the new stamps! So my creation today is made with three of our new stamps. 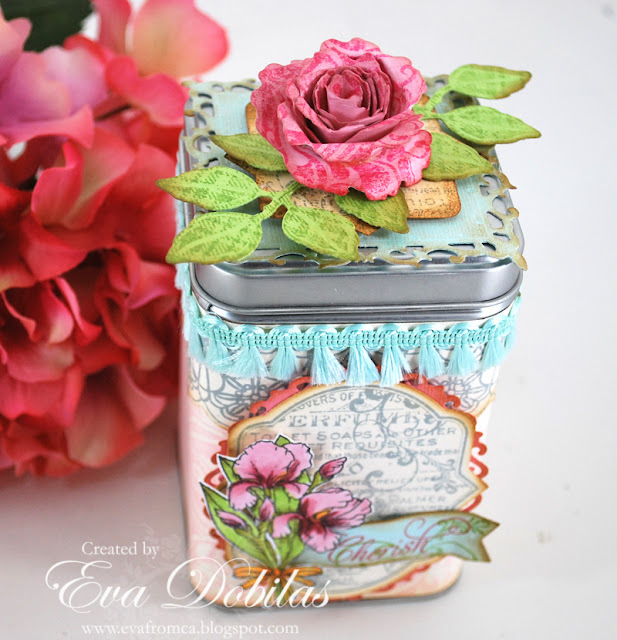 The focus is on the very beautiful Botanical Medallions and Banners set, and I used Heart Scroll Background stamp on the background of my tin and the flower as well and the Cozy Plaid background stamp on the leaves. I just LOVE the way it turned out!!! What do you think???? Of course I colored the stamped flower with Copic markers and take a look at that pretty trim. 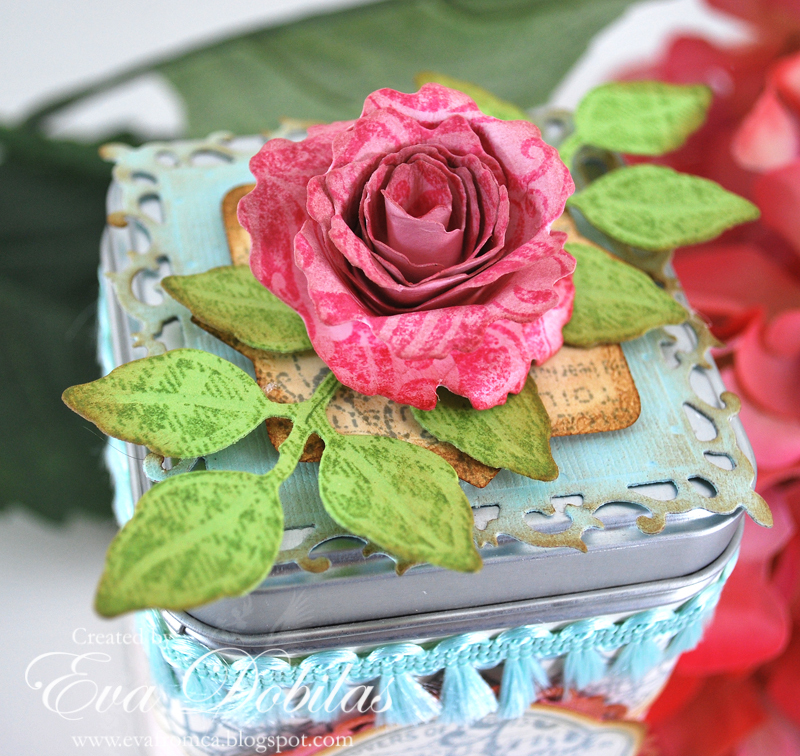 I got it from Stamp Simply store, and I just adore the way it made this tin just perfect. If you love ribbon, like I do, make sure to check out Sharon's store, gosh, she has such a divine selection!!! Here is a close up of the side of my tin with all the new stamps. And here is the close up of my pretty flower with leaves, which are by Spellbinders. I am so in love with these two set of dies, they are an absolutely must haves: Spiral Blossom One and Foilage. So right now, I don't know what to put in this little tin box, I am thinking chocolate would be nice, or a bag of bath salt, cookies...hmmm....what else? Any suggestions??? Anyway, here are the sets I used on my card today, so you can see them easily. Well, that is it for today. 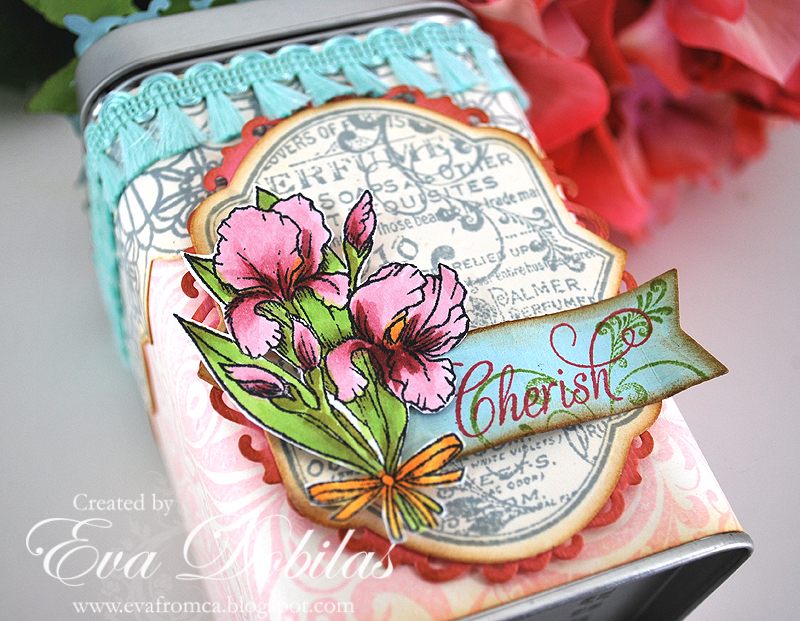 Make sure you check out what my fabulously talented Design Team Mates have created using this stamp set! They sure are drool worthy, you'll see!!! Here is the list of the ladies, who are showing pretty projects made with these gorgeous stamps. Check them out! Thanks for visiting! By the way, happy early National Scrapbooking day to all of you! I am going to scrapbook with friends and as I am typing this blog post I am sitting on pins and needles to go, as I really need me some girls time. Lately a lot has been going on that has not been too happy and I can use the creative time with friends, so I am looking forward to it very much! Hope you get crafty this weekend, I am going to do lots of mixed media stuff and can't wait!! !